Hello Friday! Today I am linking up with Courtney from Eat Pray Run DC, Mar from Mar On The Run, and Cynthia from You Signed Up For What? The topic is what is in your gym bag, but I decided to make mine on what I pack for my out of town races. It couldn't have come at the most perfect time since I am traveling today to San Diego for my first race of the year. I am super excited and super nervous about how it is going to go down, mostly because I am recovering from being sick, my feet hurt, and I just suffered a fall that messed up my knee. I am basically a hot mess. SHOES: Duh! I do like to take my sandals also so I can take off my shoes and relax afterwards. I couldn't find my real comfy ones but my Rainbow ones will do. GARMIN/GARMIN CHARGER: I can't tell you how many times I have taken my Garmin but forgot the charger it so it was useless. EARPHONES: My choice of earphones are Yurbuds. They do the trick and stay in my ears. GU GELS: I have packed my favorite, Salted Watermelon. I tend to forget these all the time and usually end up buying them at the Expo. CONTACTS/SUNGLASSES: My sunglasses don't have a prescription on them, hence I have to wear contacts. I don't like to wear contacts but I will only wear them on my races or long runs. I hate squinting during my runs. GLOVES: I don't like my hands to be cold so I use these super warm North Face gloves that my sister in law got for me a few Christmases ago. They actually have a clip on them so when I don't need them anymore I clip them to my SpiBelt. Obviously these are seasonal. I only pack them during my winter races. VASELINE/BODYGLIDE: We all know how runners tend to chafe! HAIR ACCESSORIES: Let's face it I have a mop on my head and it needs to be tamed for races. MY RUNNING OUTFIT: Okay I actually know the shirt I am going to wear but I have not decided on what pair of compression pants I am going to choose yet. Oh decisions, decisions! A girl can never have to many options. I also just got this new sports bra that I absolutely love from Brooks. It has such great support and it was on clearance at my local running store. Score! MY POST RUNNING OUTFIT: I have to usually change into a warm pair of clothes immediately after a run because I get cold super easily. So I try to change as soon as I can. The worst is walking around in wet clothes from your own sweat. I usually come out completely drenched. Isn't my gym bag so pretty? Two more things that were not pictured but I do like to take with me are compression socks for post race and a hand held water bottle. Those socks are great especially on the long drive back home. I am hoping to hit up the Expo and see if I can get a deal on a new pair. As for the water bottle I usually only take it with me during summer races. I have this big fear of getting heat stroke so I like to stay hydrated. I always take throwaway clothing for races. When waiting in my race corral, particularly at Disney races, where you wait such a long time, it is a nice way to stay warm. I also have brought something to sit on such as a trash bag or an old race mylar blanket. Have a great race this weekend! I debated on taking throw away clothes for this race since it is a bit chilly in the morning but instead I am going to just wear a trash bag over me. That I figured I can get at my parent's house. Looks a lot like what I take for races! Including the "toss" clothes and the "after" clothes (which get packed in their own bag for gear check). 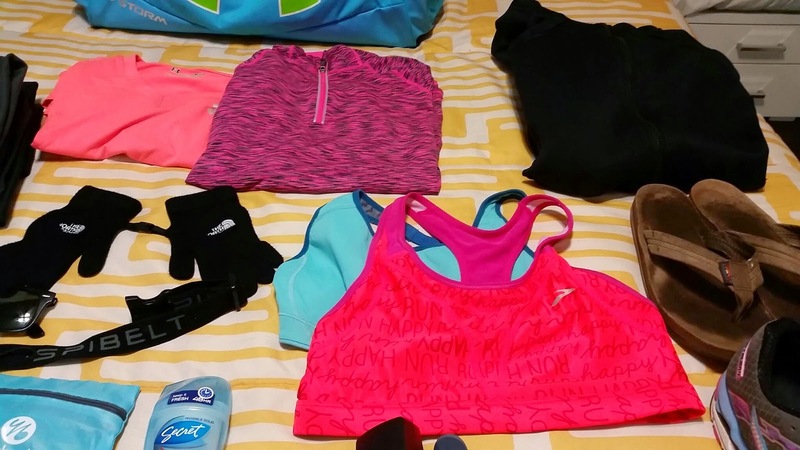 I also pack a second set of race clothes just in case.... have a great race! Thank you! I have never checked in a bag. I always just have my hubby or parents hold my clothes and have them ready for me when I cross that finish line. 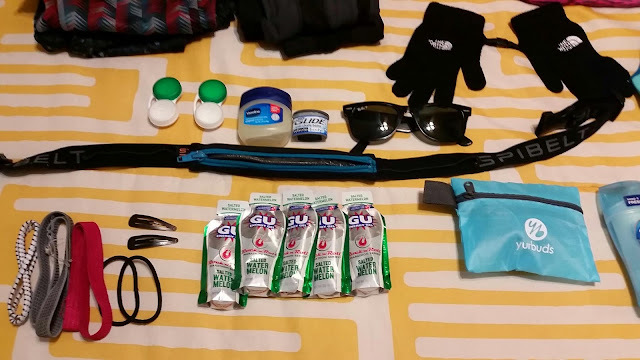 I make sure to carry on my shoes and also bring post race fuel (in case race is crowded or not in the mood for the bagel... usually its a bar or banana). If I know I am going to be aware from a hotel or my home for a bit, I pack towelettes to "freshen up" following the race. I never thought of taking towelettes with me but that sounds like a great idea! 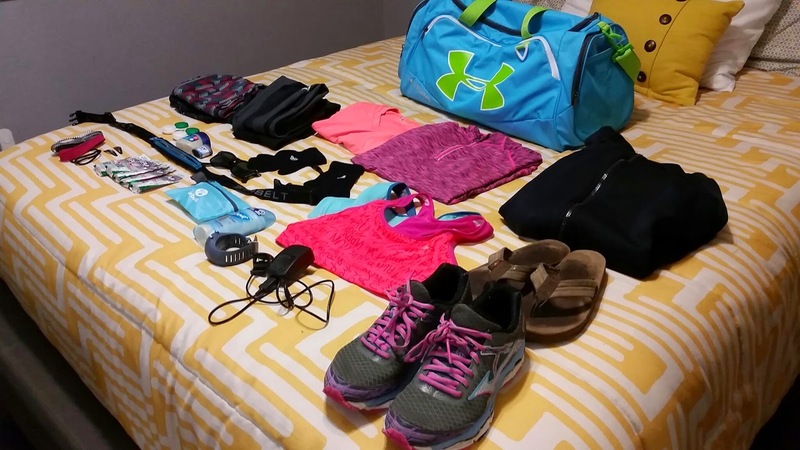 Yes, your race bag is pretty! Nice that you can pack all that stuff in there. I've been thinking about getting a Spibelt, they seem to work pretty well. Good luck on your race! Thank you Janelle! I really like my SpiBelt because it has lasted me for such a long time. Good little investment and it doesn't cost too much. 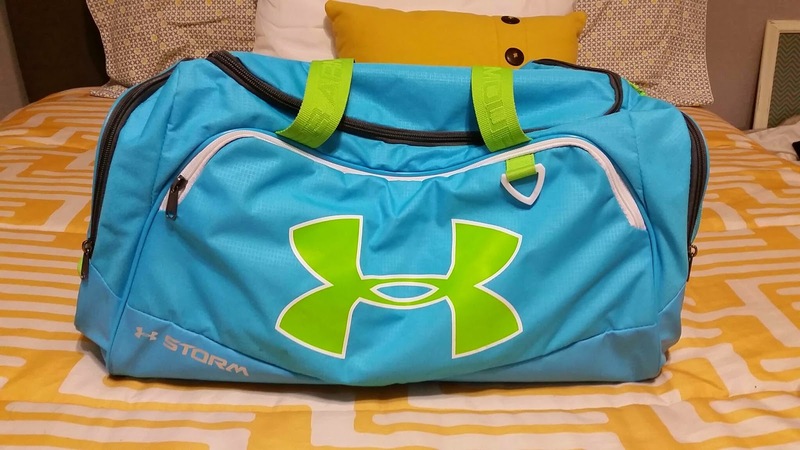 Love that under armour bag! Anything with bright colors usually makes me buy it. I am racing the Hot Chocolate 15K with my husband next weekend and can't wait! 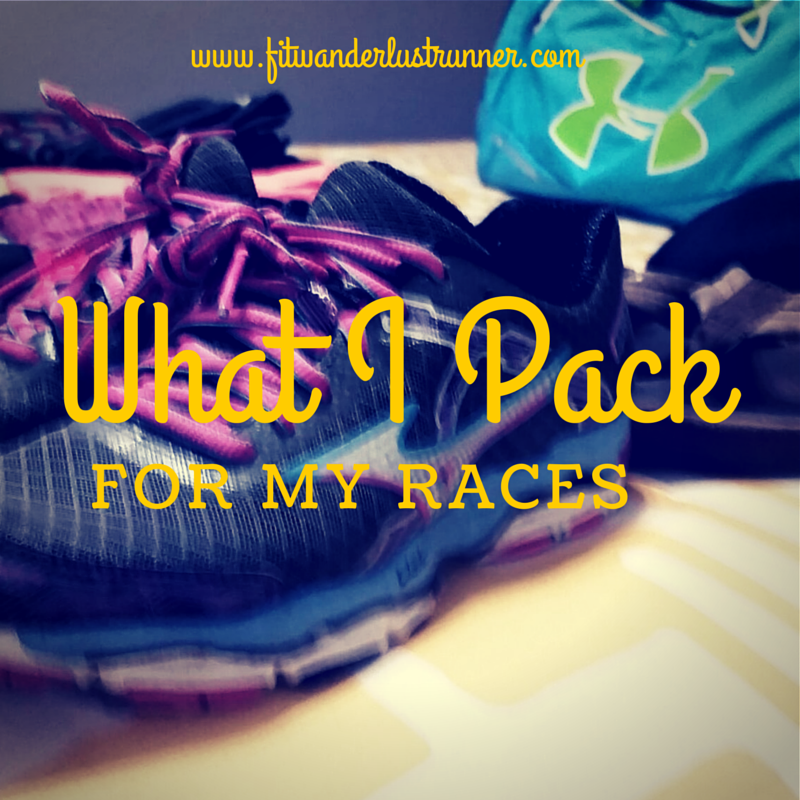 On races I usually like to pack everything I think I might need just in case and lots of options for race clothing. You never know what the weather might be the day of and it's better to be prepared. Good luck! I lay everything out the night before my race as well to make sure I have it all. Salted watermelon is my favorite GU too. Isn't it just the best? I have tried others but this one is just my favorite. I always inevitably forget something when I travel, even if I make a list. Good luck this weekend. Luckily I didn't forget anything this time around. I knew I didn't have certain stuff but I was able to purchase it at the Expo. Thanks Mar! I LOVE your Under Armor bag! Great colors. I also like to put on flip flops as soon as a race is over. I've got a great pair of Crocs that are superb for recovery, believe it or not! Good luck! I got it on Amazon and it was pretty affordable. I used to use Crocs too. They were so comfy!